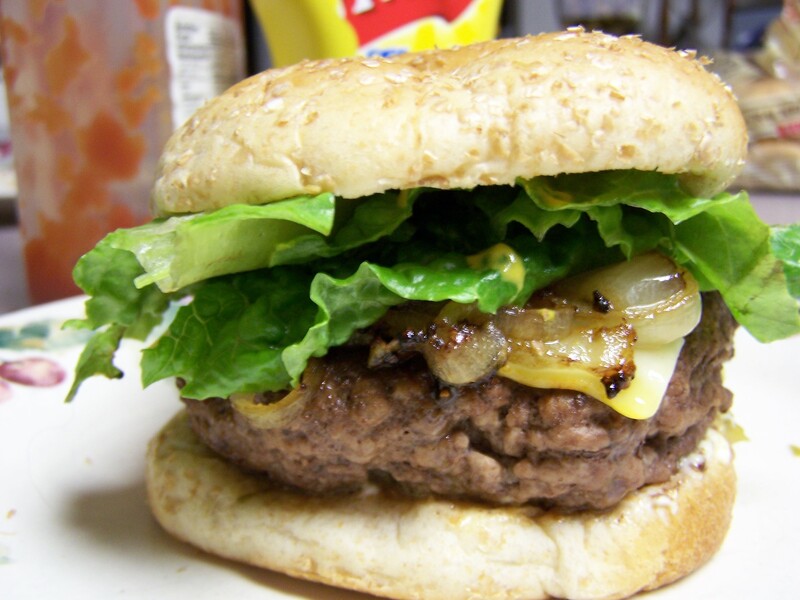 If you do an internet image search on “bad foods”, the primary results are those of juicy burgers. This is an issue. Because burgers are NOT bad for you! In fact, no foods are bad for you. Foods provide us with the nourishment we need to live!! 1) The burger bun: Usually made with enriched or whole wheat flour, this provides us with essential B-vitamins and Iron! And also FIBER! By the way, did you know fiber is part of the carbohydrate macronutrient group? 2) The meat patty: Standard burgers are made from beef, and beef is rich rich rich in IRON and PROTEIN!! There is also plenty of fat. Oh, and ZINC and B-Vitamins! Remember, vitamin B12 is ONLY found in animal food products! Remember, learn about nutrition in foods so you can make the choices and find the balance that is best for your life! Our bodies require a certain amount of nutrients for optimal function. While we want to nourish our bodies, we do not want to fall victim to overnutrition or malnutrition or undernutrition. BALANCE is the key to happiness!! So how about that summer bbq?? 🙂 What toppings to you like on your burger? Let’s focus on the nutrition. 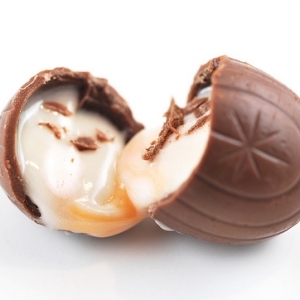 As most of the ingredients are sugar (sugar, corn syrup, high fructose corn syrup), it should come as no surprise that Cadbury Creme Eggs are full of carbohydrates aka ENERGY!!!!!!!!!!!!!!!! In fact, each Egg contains 20 g of sugar. To give some perspective, the World Health Organization recommends about 25 g of sugar per day. 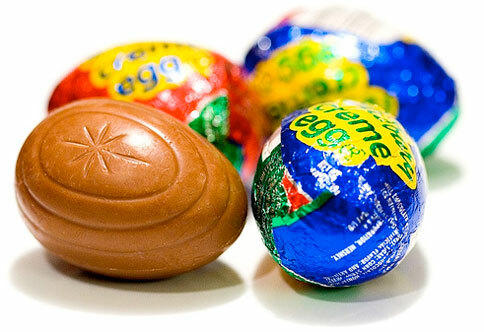 So when you consume a Cadbury Creme Egg this holiday, think about A LOT of ENERGY!!! topped off with a hint of calcium and protein! Check out the actual nutritional label here to see for yourself! Happy Easter everyone!! And for those who don’t celebrate, happy weekend and happy snacking!! T-7 days until Easter Sunday! And that means you’ve probably seen rows and rows of beautifully colored PEEPS lining the shelves of your neighborhood stores. Peeps are calling your name!! Go get ’em! 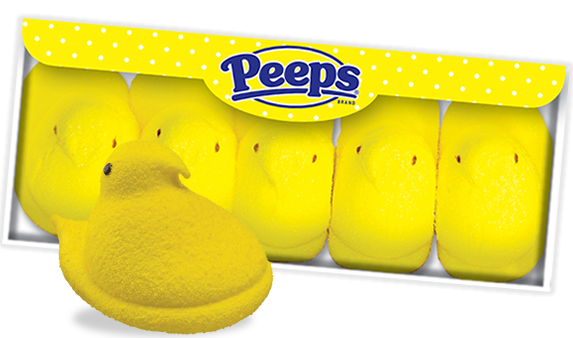 This post will be short and sweet– just like our delicious, marshmallow, sugar-coated friend, the Peep! For those of yall participating in the Positive Eats: Give up the Guilt 40-day Challenge, you will be delighted to learn that Peeps not only contain abundous (yea ok that’s not a word, but it just felt right:)) amounts of carbohydrates (aka ENERGY!!!!!!!!!!!!!! ), but Peeps also contain PROTEIN. Say what?? How is it so? Peeps are marshmallows covered in colorful sugar crystals. Sugar is a carbohydrate, and where we can obtain lots of ENERGY!!!!!!!! Gelatin is a processed version of collagen. Collagen is a structural PROTEIN that strengthens connective tissue and makes up about a third of protein in animal bodies. It gives our skin elasticity and strength, which is why as we get older (and produce less collagen), we may get wrinkles. 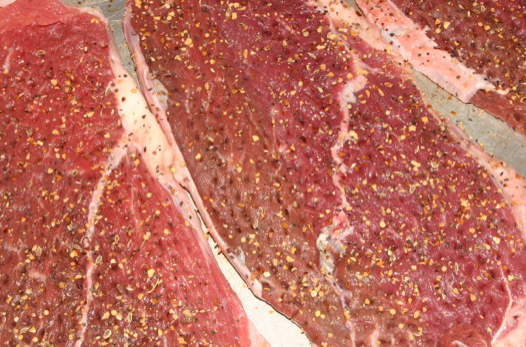 This is a piece of meat. There is collagen in there!!! The math is simple folks: Peeps = Marshmallow = Gelatin + Sugar = Protein + Carbohydrates = Strength + ENERGY!!!!!!!!!! Now go celebrate!! And for today’s relevant yet irrelevant question: Are you a Peep gobbling machine?? What’s your favorite flavor? Classic Yellow? Chocolate Dipped? Here are the three most important tips for feeling good about what you eat for the rest of your life. 1) Realize we NEED to eat to survive. Food is fuel. Food is what gives us energy, builds our bodies, and is necessary for LIFE. 2) Educate yourself on nutrition—what we need, why we need it, and how we can obtain it. Focus on identifying foods that get a bad rap (such as ice cream, pizza, burgers, cookies, cocktails) by their main ingredients (sugar, butter, eggs, milk, flour, fruit juice etc), and you will see that they are actually full of nutrition. All foods can be broken down into carbs, protein, fats, vitamins, minerals, etc. ALL FOODS HAVE NUTRITION and fit into a healthy diet/lifestyle. 3) Remember that foods are sometimes more than just vehicles of nutrition. Foods are a part of experiences, and experiences are a part of life. Cake is a part of a birthday party. Beer is a part of happy hour. Nachos are a part of a sporting event experience. Pie is a part of your grandmother’s love. But remember, they are JUST a part of the bigger picture of life. We shouldn’t think too much about food. We shouldn’t have to have endless internal debates about nutrition. We shouldn’t feel ashamed or guilty of something that is literally. just. a. piece. of. food. We shouldn’t focus our energy on whether or not to eat a slice of cake, drink a beer, order some nachos, have some homemade pie.. we should focus our energy on being present in the moment. Just enjoy whatever you CHOOSE to eat and then move on with your life! The focus should be on the experience! !